When completing a task, you might need to scan a barcode. The barcode can be scanned with your device camera. There are two scenarios for barcode scanning. In delivery scenario, your task includes the list of the barcodes which need to be scanned. For example when delivering packages to customer, it might be the list of the packages, which should be delivered to this particular customer. To scan a barcode, tap a barcode icon next to the barcode list. Then, scan a barcode using your device camera. You will get a confirmation, whether the scanned barcode is correct. In report sceanrio you must report some specific goods. For example, a merchandiser may get a task to report goods in store that will expire soon or report low stock goods in a warehouse. 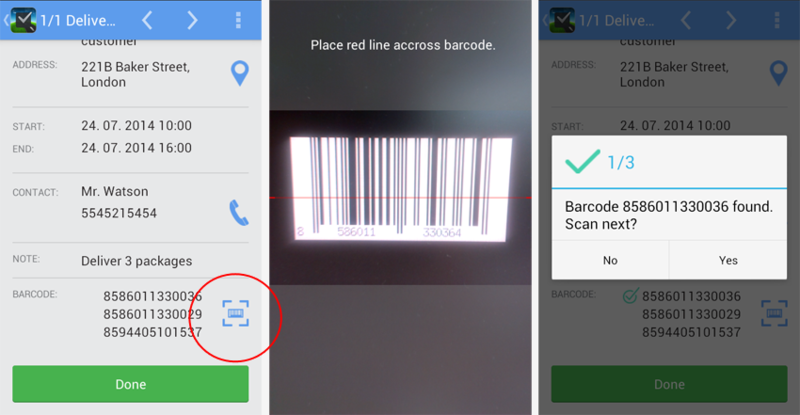 To scan a barcode, tap a barcode icon in barcode section. Use your device camera to scan a barcode. The barcodes you scanned will appear in barcode section. You might see the names of the goods if they were defined by a dispatcher.